The Irish company’s latest products are designed to protect CEOs from online storms. IN MORE THAN one way, Storyful is going through a bit of a troublesome teenager phase. It’s more than four years since the company was acquired by News Corp for €18 million – heralding a big payday for founder and former RTÉ journalist Mark Little. Now seven years old, Storyful is not a startup any more but also hasn’t reached the mature company stage quite yet. According to chief executive Sharb Farjami, there’s only one way to describe it – “adolescence”. “I would say in terms of the phase we are at, you have startup and then you have post-acquisition startup, then you have, what is a horrible phrase, but you have adolescence before maturity,” he tells Fora. Horrific is too strong a word for Storyful’s progress, but there have certainly been growing pains. Since the sale, losses at the company have swelled, reaching nearly €10.4 million by the end of 2015, according to the firm’s latest publicly available Irish accounts. To fund those losses, Storyful has taken in a series of cash injections from its Rupert Murdoch-led parent, including two cash boosts in 2016 worth €10.6 million in total. Then around the fourth anniversary of the sale last December, it received another lump sum worth €7.2 million. None of News Corp’s entities talk about their numbers publicly, according to Farjami, but he says the cash injections should be seen as a positive thing. “You would expect any large corporate to invest in its businesses. Put it this way, if they are investing in us, you take that as a good sign. There are many media companies that aren’t (investing). Part of the financial outlay could be put down to its aggressive global expansion in recent years. Since Storyful was acquired, the Dublin-based firm has expanded from around 30 staff to nearly 200 worldwide. It also has several new offices in hubs such as Sydney, New York, Hong Kong and London and now runs a 24/7 news desk that mines social media content to license out to other media organisations. The largest share of its staff, roughly 100, are at its Dublin base, with New York, the second- biggest office, housing nearly 60 employees. According to Farjami, the office and staff expansions aren’t going to stop any time soon. “News Corp has bureaus in both San Francisco and lots on the west coast, so we’re looking at that market. We think we will open there fairly soon and then we’re always looking at Asia. A lot of new hires will also be made in Ireland, where Storyful’s tech development team is based, according to the company’s local head and chief creative officer, Lisa McDonald. 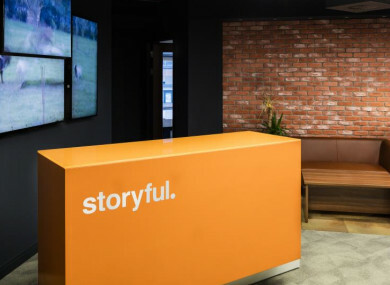 But like a lot of teenagers who outgrow their bedrooms, McDonald says Storyful has outgrown its Dublin home, which has space for only about 20 more staff. “The team moved into this Dublin space two years ago with expectations to be here a lot longer than we currently can to be perfectly honest,” McDonald says. A year after the sale of the company, founder Little stepped away – and a lot of the core team from the early startup days have also left to pursue other projects. McDonald is a relatively fresh face at Storyful, joining less than two years ago as head of creative. She says people still think the company is solely a social news monitor, but that’s not the case any more. “Newswire is our first product that services our publisher clients and is what people know us for. She says the product team is now focused on developing tech tools that Storyful’s intelligence team can use to explore obscure or closed networks. “We’re looking at how we can track deviations in social conversations around brands and organisations and catch potential risks before they blow up. Like an alerts system. Storyful’s newswire clients are some of world’s biggest media outlets like CNN, ABC and Fox News, but Farjami and McDonald are tight-lipped when it comes to the names of any of its reputation-conscious corporate customers. “When crises are happening, CEOs are being brought into the conversation more and more by agitators. It’s not just about the business and the bottom line, it’s about them personally and their security. So that is an added risk,” McDonald says. To demonstrate the power of rumours when it comes to business and reputation, Farjami gives the example of the effect false stories about Vitalik Buterin’s death had on the value of his Ethereum cryptocurrency last year. “By all accounts, an awful amount of their coin was traded in between the time of it being alleged he was dead and him coming and saying, ‘I’m not dead’,” he says. Email “Four years after its News Corp takeover, Storyful is going through a painful adolescence”. Feedback on “Four years after its News Corp takeover, Storyful is going through a painful adolescence”.